Apparently, the Tories are planning to fight the coming General Election on much the same platform as the last. One imagines the commitment to the single market will be removed and the immigration pledge will be altered. I will be voting Tory, unless it makes sense in my constituency to vote Labour or Lib Dem to prevent an SNP victory. But they get plenty wrong. They should be willing to admit this and change course. My wishlist for five things to be removed from, and five things to be added to the manifesto. Possibly the most expensive and ill-thought out commitments a government has made. Committing them to raising pensions at 2.5%, wages, or inflation – whichever is greater. Constantly ratcheting up the cost of pensions at a time when the government should be attempting to wean people off dependence on the state in their dotage. A transfer of wealth from the young to the old. And this is the perfect election to get rid of it, the idea that the over 60s are going to vote for the IRA candidate is for the birds. An expensive boondoggle that will be overtaken by the market in autonomous cars. There is no need for it or for any mid-distance point-to-point infrastructure investments. Edinburgh/Glasgow – London/Birmingham, sure. But London-Birmingham? Please. Autonomous cars and new ownership models for cars will mean people can travel quickly, cheaply, and in privacy within our current/slightly expanded road system. The Tories should be the party of earned, not unearned wealth. Yes – parents should be able to give a certain amount to their children without incurring IHT. That rate should be increased with inflation (as should all tax thresholds). But for the party to truly ‘solve’ intergenerational inequality, they need to increase the churn rate of money between generations. More sales of property from the newly dead would increase the number of homes on the market for the newly wed, decreasing prices and increasing the efficiency of the market. Previously I leaned towards total mortgage tax deductibility. This would lead to an incentive to take out mortgages and an increase in the inefficient allocation of capital by banks (more mortgage lending, as it’s safe and into fixed assets which banks can reclaim, means less lending to riskier enterprises that will have greater payback). But making mortgages tax deductible for anyone who has owned a property for fewer than five years would massively decrease the cost of getting onto the ladder and increase their spending power as they got onto the market. It would be costly and would increase house prices, but combined with a campaign to build millions more houses by reforming the planning system this would dramatically improve the fortunes of the young in this country. London risks becoming unattractive in the future as a result of Brexit. It will remain one of the two global cities, but could decline relative to Paris and Tokyo to become closer to them and less like New York. This is unacceptable. London pays for the rest of the union. From Cornwall to Clackmannanshire, London pays for it all. An investment in Crossrail 2, in two new runways at Heathrow, a new runway at Gatwick, and a rapid transport system between the two, and a change in the planning system to favour development unless the area is of special significance would save London from any decline and revitalise it – the young could afford to live there, the 30-50 bracket would no longer abandon it. We could steal aviation market share back from Dubai. London is our national champion, and yes there is too much focus on it and not enough on Glasgow, Manchester, Edinburgh, Birmingham, Newcastle – but we cannot focus on those without London paying for them. It’s a stupid policy. The one group of immigrants the country is in favour of. And we’re saying to Chinese and Indian students that they’re not welcome here when we need them to pay for our universities. Change it. And in any immigration reform have any student completing a Masters or PhD offered permanent residence. DfID needs reform. The DfIT should sit under the Foreign Office anyway. And the FCO needs investment. Bringing the DfID under the FCO should not be seen as a way to scrap the 0.7% target but to make it more effective. With true business cases used for every project and recognition that if the 0.7% target isn’t reached in one year it could be set aside for projects in the future or for acute crisis response. Air quality in London and other major cities has become a bigger theme recently. Changes to the Congestion Charge should be combined with a generous scrappage scheme for older diesel and some older petrol cars with an added incentive for anyone turning a diesel over for a new, autonomous ready EV. We should aim to become the global centre for autonomous vehicles, stealing the lead from California with a permissive testing system. As part of our Brexit strategy we should be establishing free ports and should incentivise builders of autonomous vehicles to establish in these zones for export. The vote to leave the EU is currently subject to a judicial review. Or so the Mail and others would have you believe. Votes are to be recounted in Wisconsin to deny Trump the presidency. Or so Twitter would have you believe. No, the method in which the UK triggering Article 50 is currently under review. Is the case being brought by people with a desire to prevent us ever leaving the EU? Yes. Will the case prevent us leaving the EU? No. Will the protest by the SNP prevent the UK leaving the EU? No. Is it right that the case is brought? Probably. Is it right that the case is able to be brought? Absolutely. The UK is a representative democracy, not a pure democracy. In this case, our MPs delegated the responsibility for the decision to the people. The people instructed the Government to arrange for us to leave the EU. The manner and end arrangements are up for discussion. The Government has to institute the decision to vote to leave the EU in a legal manner. That means allowing the judicial system and legislative system to work. If laws need to be changed to enable us to leave the EU, that’s a minor stepping stone. It won’t make a difference. The government has a mandate from the people to bring the UK out of the EU (whatever that means in practice). In the same way, the petition to recount votes in Wisconsin is right. Should it have been brought by Jill Stein? Well, I don’t enjoy the idea of denying anyone – no matter how abhorrent or anti-scientific their views are – access to the legal system. But where there are concerns about the votes, it is right that there should be a recount. It is not likely that this will change the outcome, but it doesn’t matter. Faith in the system is paramount. Even if people disagree with the system, it is vital that the legislative, judicial, and executive branches are all able to operate within the law without undue interference from one another. I voted to leave the EU. But I am happy to see a case brought against the way the government will trigger A50. If the appeal fails, the government should be happy to push a bill through parliament. If the SNP want to frustrate the efforts of Westminster to withdraw the UK from the EU, Westminster can pass a law making explicit that Holyrood has no competency in this area. Powers that Westminster has devolved, Westminster can un-devolve. This isn’t complicated. It’s how the system works. Governments should be frustrated by their legislative and judicial systems. Anything else is tyranny. The EU referendum was not, to my mind, a vote to stick two fingers up at Europe and become total isolationists. Nor was it a vote to restore the Commonwealth, or to focus solely on the Anglosphere. It was a vote to remove ourselves from political overreach by a bureaucracy that no longer served our best interests. We can still, however, remain firm friends with the continent. The latest indications of this are from a very surprising source – Jean-Claude Juncker. The appointment of Julian King to an anti-terror post is exactly the sort of thing the EU should want us for, and is exactly the sort of thing we can continue to offer the EU after we leave. Our security services and our general defence capabilities are second to none in the EU. We can play a valuable role in helping our allies in the EU and in NATO remain safe, both in the context of Islamist terror and a revanchist Russia. We can use this to our advantage when it comes time to negotiate our trading relationship with the EU. Nothing so coarse as to say that we won’t help to save French and German lives, but offering our expertise in building the security services necessary in exchange for a trade deal that would benefit both the UK and EU. I do not, however, expect any information on this to become public. The EU will need to punish us in public for leaving, so expect continued opprobrium from the likes of Guy Verhofstadt and Juncker, and we will need to accept some largely cosmetic punishments. However, the strategic interests the EU has in our friendship are a compelling case for negotiating a fair deal with the UK. Too much punishment will lead to a UK that refuses to work with our allies on the continent and will weaken EU and UK security. There is a balance to be struck between punishing the UK publicly whilst admitting the EU needs the UK in private. We can accept that and all benefit in the longer run. After Connor’s rather depressing piece… I just wanted to say. This is the greatest time to be alive. For the average human, at least, in the history of humanity. The world has never been better fed. Whether you’re a Congolese subsistence farmer or a land whale taking your mobility scooter down the aisles at Asda, the world has never had more food. Your odds of starving have never been lower. Thanks to a combination of improving crop yields from things like Norman Borlaug’s dwarf wheat and better fertiliser, you have the joint advantage of low food prices and high-calorie consumption per person. Food is cheaper than ever and more plentiful than ever. As GMOs become more widespread this will continue. The world can’t be fed on organic food alone, food prices would be far higher and ever more land would be needed to grow food. GMOs save the environment and save people from starvation. Thanks, Monsanto! Connected to the above, the world has never been more prosperous. 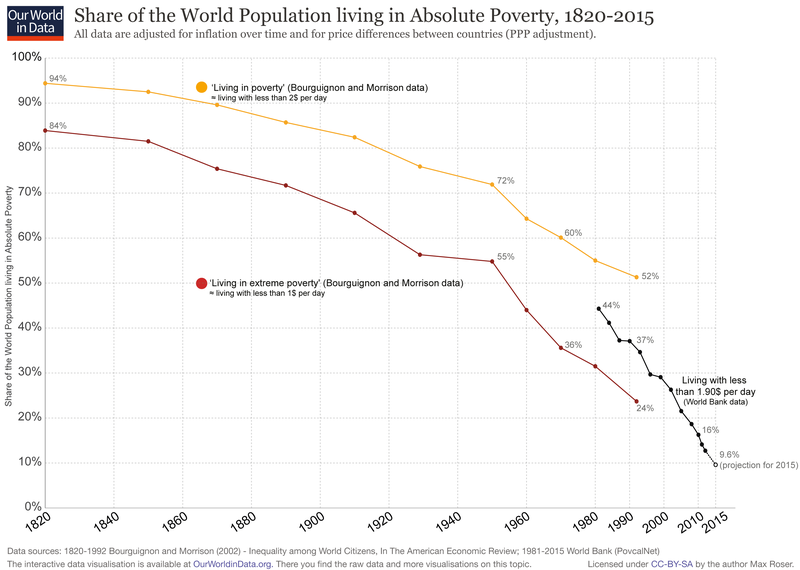 Poverty rates are collapsing, driven primarily by China and the wider rise of Asia, yet there has never been a better time to be the average person in a developing country. The world has never been more healthy. 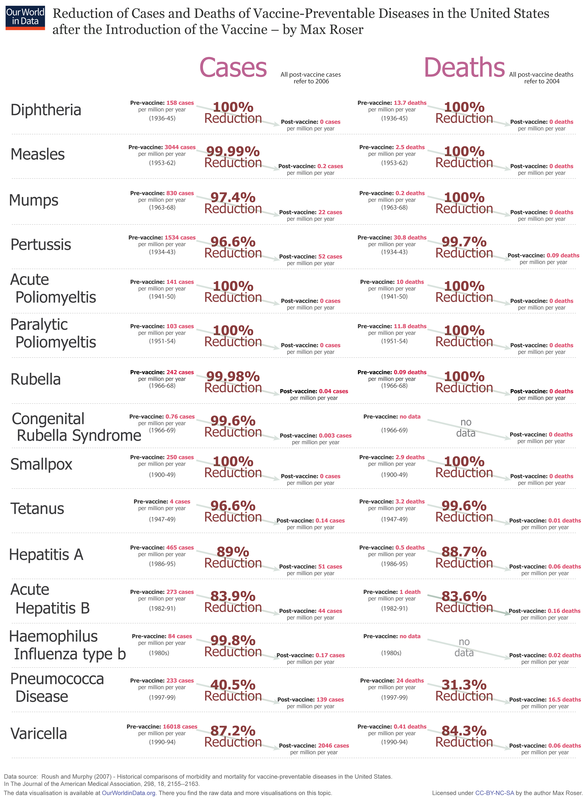 Thanks to the rise of vaccinations, pumping mercury (amongst other scary sounding chemicals) into our children, the world has never been more disease free with many entirely eradicated in the Western world. We are also likely within a decade of completely eradicating Polio, the second disease humanity will eliminate after Smallpox. The world has never been less violent. Your odds of being murdered have never been lower, from the highs of pre-state society, through to the spike in the 1980s, your odds of being the victim of a homicide have never been lower. Annoyingly this doesn’t include terrorism, but so long as you don’t live in Iraq, Nigeria, or Afghanistan, you’re basically safe here too. The world has never been more peaceful (averaged over a few years). 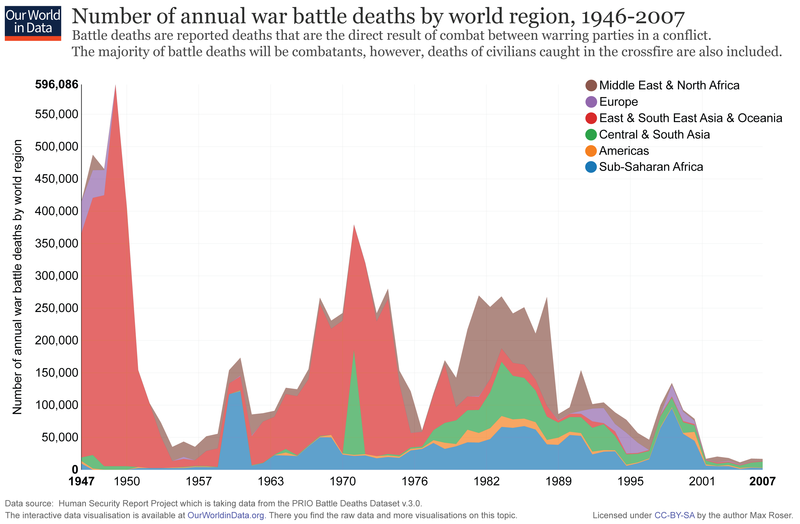 OK, I’ll admit, this one requires a caveat, but your odds of dying, or even being involved in, some manner of conflict (defined as one having more than 25 deaths in a year) have (almost) never been lower. When taken in a historical context, the shift is staggering. Connor – the world is a better fed, more prosperous, safer, and more peaceful place than ever. There’s always more to be done. But we’re basically doing fine as a species. Next year will be better than this one. And the year after will be better. So chill out. The Scottish people do not want Trident. So say the SNP, ergo it must be true. They voted for the SNP to represent them in 56/59 constituencies (though given suspensions aren’t they now the 54?). Anyway. Scotland doesn’t want nuclear weapons. It must be true, the SNP say so. Nope. Scottish voters are basically evenly split at 43/42 in favour/against the deterrent (Source: What Scotland Thinks). Some could even point to the rise from 37% to 43% as a 16% increase in support for the deterrent in Scotland over the past year or so. So, Scotland is split on the deterrent. Scotland’s MPs are not. The 54+2 voted en-masse against the deterrent, as did the sole Labour and sole LibDem MP. Fair enough. True the SNP MPs are all mindless drones unable to vote against the party line lest that +2 become slightly larger. Anyway. The SNP are out of step with the Scottish electorate. Because the SNP do not represent Scotland. As in any electoral system, they represent a view in Scotland. Do the people who vote for the SNP care about Trident? Nope. It comes tenth in a list of priorities, just after Constitutional Affairs & Independence. Source: What Scotland Thinks) But above Defence and Land Reform. So, if pushed Scots are relatively evenly divided on Trident but they have to be pushed pretty hard to actually care about it. In that hypothetical where Scotland leaves the UK, voters are again split 41/36 on keeping/removing the deterrent from Scottish waters (Source: What Scotland Thinks). The rent on the base would likely be a valuable source of income to the Scottish Government. The SNP are not opposed to having nuclear weapons defend them. They are in favour of remaining members of NATO and are fine with allowing US naval vessels with nukes aboard into Scottish waters. Their issue, as always, is with diminishing the UK, shirking our responsibilities, and attempting to drive a wedge between the UK and Scotland by insisting they are the one true voice of Scotland. The SNP are not Scotland. They may represent most of Scotland at Westminster and form a minority government at Holyrood, this does not make them the sole arbiters of Scottish public opinion. I support Trident. I’m massively in favour of having the power to obliterate a significant portion of the world. But I find the reasons for supporting Trident that are espoused by some people, particularly those on the left, as thoroughly bizarre. I support Trident because it’s a safeguard against Russian and other aggression. I find it thoroughly bizarre to support a system capable of killing billions because it protects a few jobs. You may as well give those 30,000 people their lifetime earnings and save the rest if that’s your reasoning. Be honest about the reason you support Trident. Because it anchors the USA in NATO and because it is the ultimate insurance policy. Support Trident because it can destroy the world. Not because it keeps a few welders in work. Theresa May will be the next PM. Who should be what in cabinet? DWP – IDS – so long as he has people who can think under him. Or Patel. Cameron will likely not want to serve. He deserves a break. But his relationships would be valuable at Foreign. Infrastructure – department for transport, housing, with wide ranging powers and remit. To build strong relationships with pension funds. Should also take on infrastructure side of NHS/Education. Brexit – should obviously be a Leaver. And an intelligent and polite one. Gove best suited.